A state of the art resort and hotel that aims to bring this little town in Ilocos Norte onto the Philippine tourism map opened its door to the pubic recently. 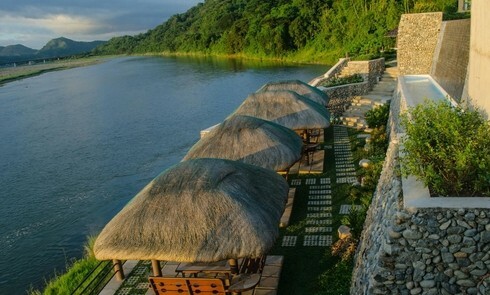 Rivermount Resort and Hotel is the first of its kind in Ilocos Norte bringing awe in the eyes of visitors due to its modern architecture and natural view that can be seen in the vast middle of a river and a mountain. Coined from its natural location, the name ‘Rivermount’ is from the words river and mountain which speaks for its location in between Laoag City’s Padsan River and the mountainous terrain of Sarrat, Ilocos Norte. The green and blue hues create an extraordinary view that makes every tourist here excited. MJ Cordero, the hotel consultant, said the hotel eyes the privilege of becoming the first triple A resort and hotel in the north that can be at par with the hotels in the metropolis. The owner of the hotel, Engineer Remigio Medrano, has the vision to put Sarrat, Ilocos Norte into the global map as one of the progressive little municipalities in the Philippines. He visualized his town as the exemplary organization that is self-sustaining and can provide stable income to its people. Through this investment, Medrano wants to promote tourism and make Sarrat as progressive as any country which has tourism as its forte. For its opening, the hotel already has 80 personnel, who are all Ilocanos. This may speak for the vision of providing more employment in the province. The hotel has a total of 49 rooms and a wide pool area with an infinity pool overlooking the nature’s gift of trees and river. Its architectural design was based on western style with a touch of Ilocano cuisine that is suitable for family getaway and gatherings. With its beauty and tranquillity, the hotel will surely make a resounding applause to all tourists who are visiting Ilocos Norte and will definitely bring additional flavor to the people’s choices coming here.